Those familiar with the history of the Beth Israel congregation are aware that by the 1950s this was the site of a clothing store called Jack’s Outfitting. The proprietor, Jack Rosen, had been apprenticed as a barber in his native Lithuania, and for a time he and his wife ran the Coronation Beauty Salon and Barbershop, located nearby at 203 Wellington Street. Jack was the nephew of Jenny Cohen, who owned the Garden Dance Hall (see 111 Bagot Street). 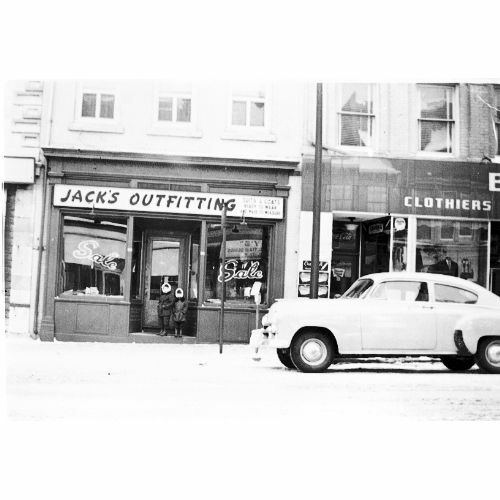 According to the city directory, Jack’s Outfitting was still at 66 Princess in 1963. New information reveals that Kingston’s patriarch Simon Oberndorffer once owned a cigar-store on this site, nearly 70 years before Jack Rosen purchased the property. He sold it to a P.O. Carnovsky (another tobacconist) in 1885, who in turn sold it back to Oberndorffer in 1893. For several years afterwards, Simon’s sons-Fred, Marcus, and Henry-took turns running the store. Between 1893 and 1896, the firm was known as Oberndorffer Bros. The name was then changed to the Senator Cigar Store, which seems to have closed around 1900. Not much more is known of the careers of the Oberndorffer brothers, except that Marcus eventually took over the business from his father upon the latter’s death in 1913, continuing on until the 1920s. The Oberndorffer brothers appear to have maintained several retail outlets for their father’s products. In the Kingston City Directory of 1899, Marcus is listed as a tobacconist not only at 66 Princess but at 356 Princess as well (at the corner of Princess and Barrie).